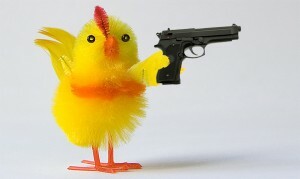 Easter Crime! Mysteries are fun any time and any where, but did you know that a country dedicates a whole week to it? Holy Thursday through Easter Monday is a public holiday in Norway, but it’s also a time when just about everyone in Norway reads crime novels. Bookstore displays are full of detective novels, television and radio stations run crime serials and newspapers publish special literary supplements. This is a very peculiar national activity. Publishers in Norway actually time series of books known as “Easter-Thrillers” or Påskekrim, and dates of publication are moved to Spring and released at this time when the sale of mysteries goes up 50%. TV stations, radio and newspapers follow suit by running detective series based on the works of famous crime novelists such as Agatha Christie, P.D. James, Simenon and Ruth Rendell. Why does Norway choose Easter to delve into crime solving? According to one widely accepted theory, the tradition began in 1923 as the result of a marketing coup. Advertisements that resembled news items were published on the front pages of several newspapers, shocking readers who failed to grasp that it was a publicity stunt. This idea spread like wildfire among other publishing houses, and the crime novel became one of the few forms of entertainment available during the Easter break. Cafes, restaurants and movie theatres were closed during Easter, which was supposed to be a time of introspection and repentance. There was no radio, and of course no television either. But everyone could read, and so the Easter crime novel was born.